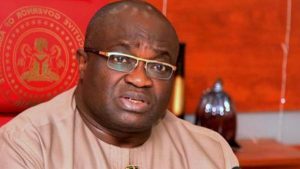 The Abia State government has announced the extension of the curfew it imposed on Aba, the commercial nerve of the state. A statement signed by Mr. Enyinnaya Appolos, the Chief Press Secretary to the Governor, Ikeazu extended the three days curfew imposed on Aba to Friday, 15th September 2017. “The Governor wishes to advice residents and visitors to fully co-operate with security agents to ensure continuing maintenance of law and order within the commercial city and environs. The governor expressed his displeasure with the situation where residents are compelled to raise their hands while passing through security checkpoints and called on security agents and all concerned to ensure that such acts, and other forms of inhumane and barbaric treatment of people, are discontinued immediately. Reports say major junctions such as Brass, Okigwe road, Osisioma, Azikiwe, Umuocham by Living Word were manned by security personnel of Nigeria Police Force and soldiers respectively. Residents who were not able to catch up with public transport trekked home.